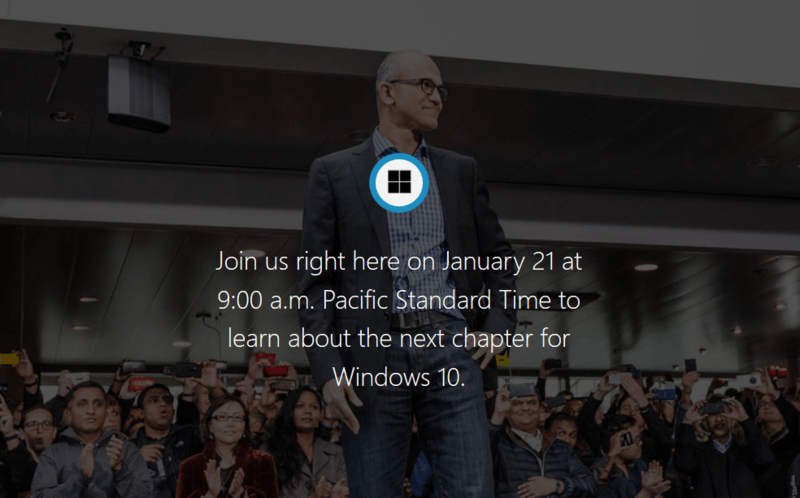 Microsoft’s major media briefing for announcing the Windows 10 features for consumers is set to held at 9am on January 21, 2015 PST on Microsoft’s Redmond campus. In the event, Microsoft is expected to detail all major consumer features and functionality that came with Windows 10. Windows 10 has been labelled as The Next Chapter, as the previous two versions of Windows operating systems, Windows 8 and Windows 8.1, have failed to gain traction especially among corporate users. Many loathes at the new UI which initially called Metro, then renamed Modern before subsequently settled on just Windows 8 and Windows Store. Also irking is confusing system settings and systems that are designed towards touchscreen instead of traditional mouse and keyboard. Windows 10 media briefing will hosted by heavyweights from Microsoft top management, namely Satya Nadella (Microsoft’s CEO), Phil Spencer (head of Microsoft’s Xbox division and Microsoft Studios), Terry Myerson (Microsoft’s Executive Vice President of Operating Systems) and Joe Belfiore (Microsoft’s Corporate Vice President, Operating Systems Group). If you’re interested to learn first hand about what Windows 10 is going to offer, you can watch the live webcast of the event at http://news.microsoft.com/windows10story/. An on-demand version of the event will also be available on the same web page sometime after the event ended.